I have talked a lot about leaderboards over the last several years. I love em, for many reasons, but one I want to mention now is Arcades. I used to love going to the arcades and spending my money, but also learning and dominating games. Then after learning and dominating the games themselves, I would take over their Leaderboards. Everyone knew I had been there and I was good, becasue I was on the Top of the leaderboard. some like Return of the Jedi star wars game I dominated so much I owned the Top 10 high scores. Check out the Return of the Jedi game Here. When I wasn't at the arcades I would know people were looking at MY score. They were wondering or trying to beat my scores. In fact when I was there, I was trying to beat any scores ahead of mine. It was a DRIVING force to make me play these games. This feeling of target hunting and satisfaction when I got better and moved up the table was intoxicating. This is the feelings I have for a leaderboard. This is what I want in all my games. People being able to play by themselves, and yet be part of a global group of people seeing how they rack up against each other as well. So onto the more relevant part of this post (if ya read the title). We are now 1 week in since I released my updated Android version of Hot Chicks the Card Game now including Leaderboards hosted and run by www.Scoreloop.com. What has happened? Has anyone got a score on the board? Has mine own score been challenged yet? Well lets see some info Man, C'mon Man, get on wiv it! Approximately 40 new a day. approximately 50 scores submitted a day. As you can see, I can tell a lot of what is going on from this score table. It is fascinating to see. I really wish I had gotten this into the game before the Android version went live several months ago. Still, better late than never. Q; What am I planning after seeing this information. A: Well I have already implemented a way to show players they can change their names in the game (for free and it's easy). I hope that highlighting this will get a lot more people to change their default Player4563461364 style ID to something more personal. This I see as a good thing, as they will be more invested in beating BobKicksArseMark2 than Player34623463 etc. I am very happy with the way this high score tale thing is working out. I am very excited to see what happens when the iOS version is out and that version will start with Leaderboards in it (YAY). Till then, Keep having fun and stiving for that High Score. Yesterday I finally go through my submission to become an iOS developer. It has been rather a struggle because i really wanted to use my company name. Yet I did not appear to have the required paperwork for Apple to see fit to approve me. After a couple of phone conversations with them (they were very nice) I finally got the correct documentation and emailed it off to them. Only... That wasn't good enough. they replied asking me to Fax it to them, as this is the only way they can process my application. WTf I thought, .. This is APPLE a Tech company telling me erm.. Fax something I have already scanned into a PDF file. Well I sent it and then had to go another step as my documents did not have my address in them. GAH! what a pain, this time i had to write a letter (they asked for Letterhead paper, which I don't have). this letter was very particular and was actually fun to write. Then I had to FAX this off as well. To cut out the rest of the story, yesterday I was invited to carry on with my application process. so I paid my 99 bucks and though I would get notification in a couple of days. However instead I got it last night. Now if i had not gone to the cinema to see 21 Jump street, then I would have been looking into putting Hot Chicks the Card Game onto my iPod. However it was real late when I got home, so no Dev for me, just bed time. I was up bright and early and decided that even though i need to go to work. It wouldn't hurt to take just a quick peek at what I need to do, to get the iPod version created on my PC (Yes, I do not own a Mac). I am using www.madewithmarmalade.com cross platform SDK for development and one of it's strong suits is supposed to be CROSS PLATFORM dev. So I was very hopefull this would be a simple enough matter to get an iPod version created, but I always have my doubts on such things. I am not quite as sharp as I once was, and nowadays I make a lot more stupid mistakes. Could this process survive my ineptitude? Well I already had done some research into what I needed to do. I had discovered a nice LINK on the Marmalade site that was a full set of instructions on getting an iOS app created on ya PC. So I followed these instructions very carefully. In another window (turned into several) I had the Apple developer connect open. I was popping back and forth collecting Cert files and Provision file and erm, oh yeah, Key files. I placed them all dutifully on my PC hard drive and suddenly at about 45 minutes in, I had finished the instructions page. Now it was about 8:45am, and I considered just going to work. However things had gone very smoothly, so, why not just give it one go ? This meant opening up the Marmalade Deploy Tool, a handy dandy utility that lets me put all my artwork and thumbnails and other important package data together for submission or simply development. As i already had a Release Arm build I figured I could use that for iOS as well, so no need for me to rebuild the code at all. I added a thumbnail and was filling out fields like version number and copyright when i realised i was wasting time, Ahah! So i moved right along to the 'Package' button and pressed it. Then I think I may have held my breath. But soon enough it popped up a red line saying failed. This message though was not even cryptic, it TOLD me what was wrong. I needed to put my Developer Key into a particular directory (I Love informative error messages). Then i tried again. This time the Red line of text told me I needed to put my certificate in another directory, and I did. ThenWhammo, 3rd time was the charm, it built a deployable package file called an 'ipk'. Woah ... I was surprised. HAHA, yeah right, you knew all along. So I put my provisioning file onto my iPod as I was told to (this is easy again) using another marmalade tool, very handy that. Then I tried to push the install and deploy button. This unfortunately was where something didn't work, for the first time this morning. Still, I figured I could just drop the package file into iTunes and maybe that would work. could it? well I can tell ya it sure did! Once finished I could see my games icon on the desktop (is it called that on an iPod?). So i cautiously touched it and waited for something to happen. I did not have to wait long, cos whammo the splash screen turned up. Woohoo! Anything after this point I reckoned I could fix. Then several seconds later the whole game was simply running. WOW, and then I watched the leaderboard list propagate, followed by the Ad system starting up. I could see one bug, the Ad sizing is a bit off (no idea why atm, but i'll fix it). And that was it. It was that simple. At about exactly the Hour mark I had an iPod version up and running, and running well. THIS is what Cross platform development is All about mateys! I am really Loving Marmalade at the moment. Next up is to get the iOS version ready for release. Hopefully within a few days. I have borrowed an iPad to test on as well. You may have read one of my previous posts about losing Ad Views, despite other information saying I should have had plenty. Now i know where they went, and yes, i mean Went! My game has two Ad suppliers, just in case one supplier cannot supply an Ad, i can ask the otehr one to fill in the gap. A Sweet system provided by IwGameAds and I like it. When you setup the Ad suppliers, you can also set what order they will be setup in, and also who is first up. When I first launched i was setup to use Inner-Active.com as my main supplier, with Admoda.com as backup. Well at some point I musta switched these when I did one of my revisions (probably me testing them in some way). So most of the Ads supplied were from AdModa.com and I had not bothered really going there since the first month. Cos all i got were about 5 Ads supplied a day. Yes, i was an idiot. How could I not have realized and therefore gone and checked BOTH Ad suppliers. I guess it all makes so much sense now eh! I am da Fool, as I fooled myself. So i am nearly done with these weekly reveals for Midway3 in Playstation Home. This game is called Whack Off and ya gonna have to whack those dang bugs! As ya can see, this booth looks awesome! And some of the prizes I feel certain people will Lurve. Now I won't be posting a picture of Miz Fortune of course, so now I have revealed all the games. Yet I still have one significant reveal left. That picture will have to wait until next week. We here are hopeful that Midway 3 will get pushed to Sonys QA and testing department by the end of this week (though this is not assured at this time). Stuck on a Define GAH! So last night I was working dilligently away on my game code for Five Golden Coins. Which mostly means at this stage playing with image sizes and also reworking my game code (helper functions) from Hot Chicks into better Helper code routines. One of the things I do when tidying up like this is to make Defines for variables and help make the code cleaner. Then whilst i was busy working on my button drawing code the screen went blank when I ran the game. WTF.. I was surprised. Anyway, what followed was a debug session that lasted more than an hour and a half. I was very frustrated and went to bed not solving the issue. Heck even when i had commented out my changes and possible reasons for the black screen it persisted. Now experience tells me that If i do not find the bug in the place I am loking, it resides elsewhere. Only I could not figure out where. so tonight i attack it again and this time look everywhere but where I did last night. In the end it comes down to my cleaning up my code. I have a scale factor for my screen, and I changed the variables to Defines and did not make them floats. So the divide always ended up as ZERO! Yup, not 0.9375 like i wanted. I found it fairly quickly tonight, but man, what a depressing thing to happen. I need more time, gah! Posted by VoodooChief at 11:55 PM 0 comments Stuck on a Define GAH! Welcome to another post about my game based on my Character Bob the Frog. Now this post is to tell you about some of the research I did for his basic character look. Now I tend towards loving research. Some of the Stuff I tend to research. The look of something and checking out pictures on the Web and in books that I have. (even though i am not an artist). Gameplay fundamentals, such as jump height. I use popular games to research this. Story elements. How are current titles telling a story, or are they even bothering. With all that in mind. Here is some of the research I did to get my character of Bob the Frog. Even though I will not be the one drawing him in the end. I feel I need to characterize himin my minds eye, so I can effectively tell his story. Follwing are several photos I took of frogs around my House. My Wife loves these things and I must say I find them cute too. I have a comment under each picture saying what I thought of this one as concerns being Bob the Frog in a phone game. This is where I started. this frog is a little sad, but is pretty much what I need. Though all his flowers are a bit in the way of course. Now to find something a bit cleaner to work with. This is a sharp picture, and this frog could do well in a more robotic style game I think, but not quite as cute as I really want. I need to have me frog exude cuteness, just by sitting there. This fat and happy frog is awesome. And has some influence on Bobs desiegns. Only his upright posture and more human look with his arms isn't really what I wanted. I know many game humanize proportions etc to get a character to be more human and more easily accepted. However I did not want this, and i also do not think it nescessary. This frightening Frog with a clock is erm. Not what I wanted, though I must say that if I need a frightened frog for some reason, this is not bad. Gotta love his big buggy eyes eh! The kid is also a nice touch that could be used as an idea later. This Blue frog is one of my main inspirations. I love his attitude and he also loks like a frog. Though maybe cold? haha. I like him a lot and He could have been my Bob the Frog, only I feel that his head is just Not big enough to display the amount of character feedback I need for him. His leg and arm proportions however are awesome. Here he is. My other main frog inspiration. Mixing this frog with the blue one above gets me to where I wanna be. This guys arms are too stubby and his legs are are way back there and basically not really in the picture. This Frog is ALL face! And what a cutie he is too! Mixing his head with the Blue frogs other parts makes me feel like I have a great mix. 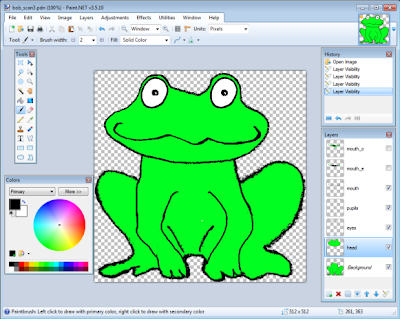 Check out my previous post for a look at my current drawing of Bob the Frog to see what I mean. BOB the Frog. Thats Bob art research for now. I hope you enjoyed seeing where he comes from and what he could have looked like etc. I just thought I would comment on this here in my Blog. * A lot of newer games do not work on the Android 1.5 version. They say they do in the stores, but in fact a lot of them do not work. * Downloading a Full version of a game (buying it!) is not a very good thing to do for people with this version of device. Simply put, if it doesn't work, you just paid good money for nothing. (though a call to the developer may fix this issue). * A lot of people with this version of Android therefore do not take a chance and buy a lot of games. (unless they have played the lite version first). This seems reasonable to me. * Admob does not work on Android versions older than 1.6. So a bunch of Ad supported games tend to not support this version and these devices. I think it is a pity that there are a WHOLE lot of people with Android 1.5 versions of phones and devices, and yet they seem to have been left to upgrade or simply to be ignored. I do not agree with this stance, and unless a game cannot physically run on these older devices, then I will make sure my games are fully working on them. I wonder how many peolpe with these devices and phones feel a bit frustrated or left out. Support this device if you can. The machines are still pretty cool imho. Well it's like that so you HAVE to go check out that site. I would also recommend the 98 dollar investment to download all those AMAZING tunes. This is a brief post as I was listening to all of Kevin Macleods music and just vetting them to see whch ones might be useful to me in the near future. Then I came across a Reggae/Ska track called Tea Roots. This was awesome and then I realised I should do another post about him and his site. Yes.. i have mentioned him in several other posts in the past. www.incompetech.com is the place. Where royalty free amazing music resides. I have to say I have been really enjoying listening to this music while i was programing yesterday and today. Though the order can be a bit weird to say the least, haha! Have fun out there and enjoy the auditry sensations. Well I have no idea what has happened. Simply put, my Ad requests (views) has just plummeted recently. Let me show you what I mean. Hot Chicks the Card Game, was released on February 14th. So just about 5 weeks ago. I am using www.Inner-active.com for my main supplier of Ads and they have done a great job servicing about 98% of my Ads. One of the Dashboard features of Inner-Active is the daily tables of Ad information based on title. I find these numbers rather baffling. The way they start out so amazingly high and then plummet about two weeks ago. From what I can see 4 weeks ago to 2 weeks ago I had 21,000 ads served, yet these last 2 weeks just 6,000. that is a massive change. Now I my game had gone on a list as a new release or something and I might understand it more. I still have had no reviews etc, so not expecting anythnig from that. My game from the start was simply a search to find type release. So what does this huge change in ads served mean ? I really expected that the game would be downloaded approximately the same amoutn each week it was out. No big changes unless maybe I got reviewed etc. No new releases list as mentioned for me to go on, unlike the WP7 version. So i expected it all to be pretty flatline. Well, as you can tell, i have no idea why i am suddenly so unpopular. Oh, i should mention that so far Hot Chicks Android version has made me a about 3 dollars in Ad revenue, not quite enough for lunch yet! I find it strange that on the Android market site my Game is live once I click the button. A most odd feeling when all the software I have created before has always had to go through testing by people other than myself. Still.... It's Fast publishing !!! Hot chicks the Card Game is now on version 2.0. Here is the Exciting list of stuff Added for this new release. 1. New Global High Score (Leaderboard) added. I am really excited to see just how good some people are at this game. 2. A friend let me borrow his Android 1.5 'Archos 7 Home tablet'. Which my game had issues running on. Well it was an easy fix in Marmalade, cos all i did was up the number of TPages in the icf file and whammo, worked like a charm. Now I am very happy to say that the game will work properly on software rendering such as the Android 1.5 machines. YAY! Iam very happy to have this fix for those people that some companies have left behind. 3. I added a Twitter button on the Credits page. I believe every person I can convince to follow me will be a great thing. Both for them, when I give away codes for games, and for me to have a built in group of people interested in my games. Oddly enough this button does not work on my Kindle Fire, yet does work on the phones and Archos and Windows that I tried it on. My Kindle opens up a blank page. WTF is that about? 4. My mate Ben found a crash. As usual his testing powers are Uber and I am happy to put a fix in for the rare occasion when this could happen (though he could dupe it real fast!). There it is. Pull My Finger the Minigame in Midway3. Ya have to time when to Pull the finger in question, and joysticks that look like fingers are odd things in themselves. Next week I will be showing a picture of our last minigame that I have yet to show a picture of, I will also show ya an image of the Feature for this scene (Marla). We are finalizing our last sever functionality and then we will be sending it all to Sony for testing and approval. So close now... After That I hope for a real release date to let you all know about. Then with some other news alongside that I know you will all be as excited as we at Mass Media Games are. I have written a lot of published games in my time. Having been a hobbyist game creator and then doing it professionally. Now i get so much satisfaction from both my Indie development as well as my daytime job. Yet they give me different satisfaction. My Indie stuff is MINE, all MINE! and I make all the decisions. Well i have now been creating these games for the last several years and I have a number of games created. They are all different and I like what I have created. Recently I realised that I needed to add more character into my games. This epiphony came about due to the reskinning of Cards on Fire into Hot chicks the Card game. I would say the makeover to Hot Chicks improved the game by adding more charactercohesive theme to various screens. More Character is what is needed.... yeah! So I have been working on my next design called Bob the Frog, well it has changed severaa times from Eternal and other variations. Now I am just calling the game bob the Frog for now as HE has become the real focus of my next designs. I have in fact now got 3 designs all featuring Bob, and yes, they are all different. However they have one thing in common, they all have bob featured in them being a character, a Fleshed out character with emotions and facial features and maybe comic timing and even.. I have a voice for him. So what i have done in the last 2 months or so is mostly design how Bob will work. How technically his eyes and mouth will work in the game. I will be starting to program this game fairly soon I hope, and the first thing I will code will be Bob and his animations. And the way his parts are going to work together. Things like Blinking or head bobbing, or maybe looking where he is going with his eyes etc. This made me realise that my first couple of designs were not quite right to introduce the world to bob. I needed something where he was dominant on screen. I didn;t want you to see Bob bouncing around the screen the size of Mario in Donkey Kong for example. That isn't enough of a size (especially on a phone) to really show off the work I intend to put into him. Why am I so stuck on adding this much character depth into my next game? Well I really believe that this is my next step. I have written so many games, yet I want to give people more connection to my games. To care more about the games I give them to play. I think this kind of thing will help a lot. My inspiration for some of this is the game 'Where's my water'. Gotaa love that croc, and yet he hardly does anything. Angry Birds are popular, though I don't find them exciting, a lot of people connect with cute characters. So i am hopeful I can get more people interested. Now i just need to find ways to get virally connected to as many people as possible through Bob the Frog. As you can see from the above picture, taken from my Desktop. Bob is in Paint.net and I have several mouths for him and he is in his separate parts. I really need to get a texture packer for this game. Cos he will be made up a large number of pieces. Yes, i am doing my own art, and when it works, I will get a real artist to redo it all and make it nice. I was looking into Texture Packer itself, maybe that will ouput something useful for me. I don't know at this time of writing, i only just installed the trial copy. Sometimes I spend too long on something and cannot get it right, If this happens I tend to get to the point where i simply say 'f**k it!'. And it'll be what it is. So i usually end up leaving the aggravating thing and come back later too it. This has been happening this morning with my Credits screen for Hot Chicks Card Game. I wanted to add the Twitter Icon and then do a touch link to the browser. In the hopes that I can improve my social networking even by a few people. I am sure some people will follow me, whereas they might not want to read my Blog or visit my site. Anyway, as usual I have digressed. It has mixed fonts up the wahzoo and placements that make my skin crawl. I have spent way too long on trying hard to make this lok interesting AND nice. I keep being reminded how cool it is to be on a team of people with the same goals. Lofty ones usually where striving for the best result in converting a game, for example my recent work on Jak & Daxter PS3 port. It is also really cool to be part or parts of groups with coomon goals, such as writing an iOS or Android or Xblig game. These communities are scattered all over the place and yet these individuals and groups are around. I see some of them every day and being part of those communities and groups is amazing and I love the sesne of camrarderie etc. Having Peers in the Indie scene is very important to me, they not only motivate me and help me, but I love to just feel I am not alone. Generally I am alone nowadays in my Indie development as my other teammates have chosen to give up on the Indie dream, finding the work too hard and too long for scant reward. These people also have families they would rather be with, and also get some sleep (haha that would be nice!). So in this article I mention several things that my Peers bring to MY party and Feelings. I will also name a whole bunch of handles from the community connection system that I love. TWITTER, yup i said it. The social networking software Twitter is my connection of choice and I love it. Short and sweet bites of information and glances into my Peers lives. Some make me laugh, some make me think, and some make me sad. I do not beleive I have not met anyone on my Twitter list, anyone at all. Yet I would consider a whole lot of them friends of mine, as they inspire and help me in more ways than telling me just how to do something. I am going to name a bunch of people. I will also neglect a lot of names that should be in thos post. I apologise to all the ones I missed, it is just hard to crawl through 750 tweeps and mark them up. It would also make this post rather large. Note, If ya named in one category, I omitted your naem from other ones, simply put... Some people Inspire me are friends and also give me a sense of community etc. I started my Indie games creating them for Xblig (as it is named now). I love this platform and would love to do more. When i got in I was in at the start of making Indie games for the Xbox and The community there was amazing, it was mostly ran or coralled by MVPs that really care/d. Those MVPs are still around even if for me the platform is not on my development list. Following are a group of Twitter Peeps that really give me a community and togetherness. Though not all are from Xblig now. There are a lot of people follwing me and I follow back that I have never met. Yet I have read about their lives and their work place changes, and the issues with weather and travel to that new job, be it on bikes or whatever. I have read about late parties and police hassle in the next door neighbours house. I have had very friendly comments and suggestions from so many people, this next list are a few of those people that I would call friends I have never met. Some people inspire to do better with my games. Usually through their own efforts at creativity or perfection. The fact most kep on trying like myself makes me feel like I should also try harder and do more.This list of peers are the ones more directly working on games and some are way more successful than others, in some cases they are living the dream of being fully independant, one day I say! Some of my Peers work very hard and get lots of stuff done and Out. I am constantly being updated to what they are doing to their games and are always about to finish their next title. This puts pressure on me to also finish what I am working on. I wanna be just like them. The next few names are some that I would say do this. Ok, I lied when I said i had not met anyone on my twitter list, there is one and he is so helpful. Gotta love what he has been doing for the last 10 years being independant, even if not directly in games. Interestingly this group of people who have helped me out with tech bugs I have faced in the middle of the night when most of the world has been asleep are also huge community Peers for me. When i had a tech bug on A Shooter at 2am PST I asked a question in Twitter and It was amazing to get help from my Twitter crowd. Simply amazing! Some of the Peeople I am following provide me with all sorts of insight and information. Mostly these people help keep me sane (as much as i am!). They provide funny insightful tweeets that I cannot ignore. The group of people commenting on all the games out there, the articles about this game or that. The detail and passion that some people have for the Indie games is astounding and I have to say it really infuses me with more passion of my own. These next Peers tell it like it is, or tell it how they see it and are always hyper-active in the community. Gotta love all they write and video (I Do). I do not always agree with them, but i love they write with passion and verve. This is a special mention, as there are times when people point out stuff and ya go.. hmm, yeah you are soo right. Jim is one of those people and he did this again to me the other day, and is the main reason for me writing this blog post. Becasue of him, my Blog picture now looks a lot more professional and as Jim said after I changed it, he can now take me more seriously. It can be these little things that help or hinder ones progress in all sorts of ways. Thanks Jim. Thanks all you Peers of mine, Love ya all! It's true. I have a love for Leaderboards. High scores are a thing that make me Tick. I also believe whole heartedly that it makes other peoples hearts tick as well. I have always loved High scores on arcade machines. way back when i used to spend a LOT of time in the arcades trouncing scores that I would see, and if not yet able, work on making sure I was top dog. 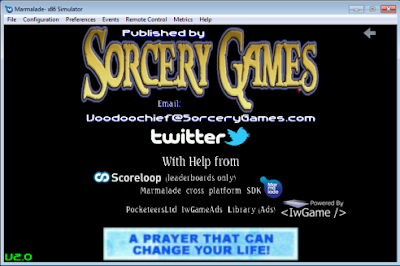 I have posted before that I will not do any more Xblig games while i do not have access to the leaderboards. I am gonna stick to this, even though i really want to code one or more of my designs for the Xbox. Now I am coding the Android, and once my license is sorted I will be doing the same for the iOS too. I now HAVE access to leaderboards thanks to Scoreloop. The integration with Marmalade is pretty neat, even though I was a bit slow to get the whole thing working. Still now it is working and I am just putting the finishing touches to some popup dialogs i am really happy. (side note, Scoreloop can do so much more than just leaderboards). Scoreloop is allowing me to really get into something I love. Competition. Faceless competition that pits man vs man vs woman vs kid and anything else that wants in on playing the game. Now this could all end up being a huge disappointment if this leaderboard doesn't accumulate many scores. It may look like a complete fail then. Time will tell, and as I have only had approximately 1300 downloads to this point, I might not have a huge leaderboard. Then again, maybe I consider 1000 users in my leaderboard for my game a Huge win (Actually I do). I will compare this possible number of entries with the game 'A Shooter' that I did as my last game on the Xbox. I had to use a Viral leaderboard passing mechanism and I have to say that I barely made 100 scores in the table. Even though I had over 1000 purchases. It is just not a great system really. The main thing is that 1000 entries will make me very happy. I wonder what could have happened if my Xbox games had included real leaderboards. I feel sure the games would have done better, simply as friends tell friends they got this great score and are top of the leaderboard etc. Then there is also the reverse side of things, this is where you see a huge score on the leaderboard and go WOW, someone owned, I bet i can do the same. Either way it is a huge win for the designer/developer. When i finally get this Hot Chicks game out on the iOS platform I will be able to compare retention of players compareed to the Android version which is about to get it's second update to add this feature. Whereas the iOS will go out first time featuring leaderboards. It will be interesting to see how they compare. NOTE: I want to say that I had a problem with Scoreloop and opened a private support ticket. It was serviced very fast several times over a couple of days till my issue was resolved. I think this support was truly awesome. I have no name with scoreloop yet, no existing games with their SDK that I have not even paid for, yet their support was excellent. TY Scoreloop. Here is this weeks Game Picture from #Midway3. This Beans Beans Beans game is very pretty looking with so much color. Hope everyone is having fun in the Midway and with Cheez-its. go get that free loot! (ok, so ya have to play for it really, but it only costs time). I decided to do an Ad campaign for 'Hot chicks the Card Game'. I figured I would start it at about the month published mark, as by then I was thinking i would be mostly settled into a average number of new consumers and maybe an average number of losses. I have no real idea if a month is the right time, but it is my best guess. Coupled with the fact I do not want to wait forever to do an Ad campaign, it was time to get sorted. As it happens my campaign was set to start on March 14th. It was real easy to setup as under the Android marketplaces publisher account you get to see the list of your published games/apps. As part of this information strip it as an 'Advertise this App' link. So i pushed it. things went very smoothly and then it told me I needed to use Google checkout for funding. I dutifully did all this and added my 50 dollars. Yeah, that is really what i was gonna advertise with. I selected that I would spend 10 dollars a day and that I would run the Ad for 5 days. Once ya daily money has been used up, the ads for your game simply stop being served till the next day. I was VERY VERY interested to see what difference this could have made to my games presence on the market. No one has given me much hope that this would make much difference, but i had to see it. Of course we are not yet at the 14th of March.. And yet I am talking in the past tense. The reason for that is that all Ads have to be approved, and my Ad was not. So it is kicked out of the list. It will never happen and I now have 50 bucks over in Admob land waiting to be used. (of course I will use it on my next game). I am very disappointed. I really hoped to find out if the Ads would make a difference. If I could have valued the Ads then I could have figured out what I would do when my next All ages game is ready for release. Now i am still in the 'don't have a clue' category. Hopefully anyone else doing Ads has had better luck than me. It is what I get for making a 13+ game that then gets rated fully mature due to it's Sound FX. Although I have been struggling with a very particular issue with my Scoreloop leaderboard implementation. I felt that I had to put it on hold to get a new version of the game out. simply becasue It has a crash. Anyone multi-touching the screen to play the game (using two thumbs etc) were likely to get the crash. Having a released game out there with a crash in it was gnawing at my soul. Every day since i learned of the issue it has been bothering me. Building momentum in my brain till I could stand it no longer. I really take it as a source of Pride that my games do not have many bugs in them, certainly not major ones and certainly not reported ones. Here are some links of where it is at.. I hope the people playing it get the updated version. I believe the Scoreloop enabled version will go live some time next week, If i can get over my Ranking crash problem. It is hard to fix as it is on a friends phone (thank you Ben!) and is therefore a pain to debug haha! This has gone LIVE today in Playstation Home. As my Day job i work for a company in southern California called Mass Media Games. We are well known for working on very difficult conversions along with the occasional original gamne release. Though mos of those were for THQ, who have not employed us for an original game in some while. Still we keep our creative side going by making stuff for Sonys Playstation Homes Virtual world. We create lots of Virtual objects/prizes/clothes/furniture and also we are very proud of our environments or scens such as the Midway areas. We are going to introducing Midway 3 as soon as it is ready (gotta love self publishing :). We also have a few surprises for everyone in Home, but i cannot talk about them at the moment. Maybe Jack Buser might mention something this week at GDC (i can only hope!). Anyway back to the point of this post. Today we had one of the things we have worked on the last month go Live. It is a Minigame that Sony asked us to make as a promotional item for the Cheez-Its brand. In fact we accumulate all the votes and a bunch of metrics for them. So your votes DO count. This was one of those jobs where they asked us to create a Teleporter and Scene Minigame. They also asked that it be a bit like one of our existing minigames. so it was modelled on one of our games from Midway2. This was ok, but for me I was really hoping for a completely unique and original game. Still it was fun to redress and alter the game in various ways. Then we also added the back end Server support for all the vote tallying and metric collection. I am REALLY hoping that this Minigame accumulates Millions of Votes and hundreds of thousands of players. Then I am sure we will get more work and more interest in Home from Big companies looking to advertise etc. I hope you enjoy voting and winning the two prizes. The hardest part of doing this minigame was in fact setting the Difficulty level :O Personaly i think it too easy being able to cplete it with more than half the time left. Still Watching others play it live shows me going easy was a good move as i see so many of our frustrated animations being played. wow! 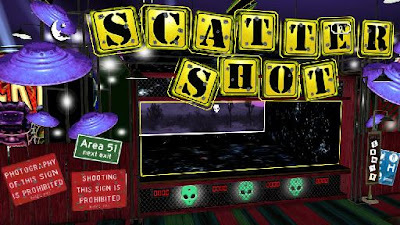 Following my weekly reveal of each minigame in Midway3, Here is a the latest screenshot showing a game called 'Scatter Shot'. I owned on this game, as I usually do on the shooting ones. Now if ONLY i could get level 10 on 'Ball Squeezer' (yes, midway1).. Grrr. I can pound level 9, but cannot get level 10 done. 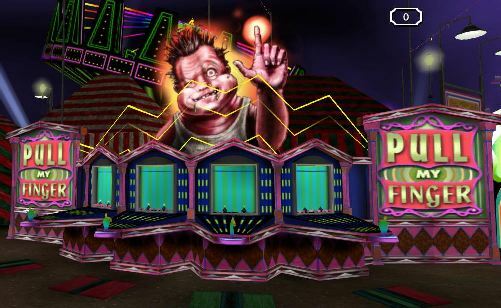 I was also playing a minigame called 'Pull My finger'. Which i am not so good at! Yeah It is true. I think I have the leaderboard working properly for my game.. Only.. Properly might be a stretch. It seems when testing it tonight I realise I have overlooked at least one aspect of functionality. When i score more than I did previously, I need to re-get the possible new Rank (leaderboard position) I might have attained. Well duh! So i have added that, only i cannot test that in the test leaderboard as the Id you are given happens to have the top score in the test leaderboard by far. Hard to test advancing my position there. yet I can fairly easily test it on my Android device. Still It seems like I may have missed some other possible happenings too. Not sure what at this time, but I will try a full test cycle soon I hope. As for my crash, I have traced that to someone who does not have a User Profile as yet in any Scoreloop enabled game. A simple validation check should allow me to continue without error, i hope. I have to test this on a friends Android phone, as I am known already on my own devices. Finally one of the reasons I have managed to get most of the Leaderboard done is due to a slight redesign of the High Score screen. By removing the Top 5 list I have simplified my situation as regards implementation and overlapping issues in the screen as far as retrieving scores etc. Now I know tat al my problems are in fact programmer errors, and armed with that knowledge simplifying the overall task is the way to go. I am gaining confidence and knowledge on all of this great SDK, but i realy cannot wait to be totally solid on it all. I want to get a new version out as soon as this one is stable. If overwhelmed by your current task, simplify it or reduce it if possible. Simplifying it can be as simple as breaking off less of a task to chew or reducing a large task into smaller more manageable bite sized pieces. I couldn't come up with a succinct title today. I seem to have a bunch of smaller items to moan about or discuss. I know I should probably do them as separate posts as Blog guidelines suggest, but I don't care right now. Number 1 on my List is the nice phone call I just had with Apple Dev Enroll. The lady (Julia) was very nice. However It seems my company Tax documentation is not good enough to become verified as a company in Apples eyes, Gah! The story continues on, and now I have been trying to be a developer for 2 weeks. Number 2, Last night a friend told me he could crash 'Hot Chicks the Card Game', and then he proceeded to show me on his phone. Upon playing with the crash a few times I easily discovered what the issue is. It is a bug i had way back when and solved. So how could it be back? Well after looking over my code I realised that when I added in the Ad support code I inadvertantly regressed my bug fix. Geez, and my game is out like this, GAH! Number 3, this is a carry on from Number 2. I now have the bug fixed again of course, only I cannot do an update at the moment as I am still in the middle of developing the update with the leaderboards added in. So stuck in No Update yet position! Gah! Number 5, Ok, no GAH! in this one.. oh wait, I lied haha! The leaderboard code is nearly complete. I added in a new drag control last night and it seems to be working well. Only this has introduced a new bug I will fix. So once that is done I have the Profile name change code to write (using the on screen keyboard entry, woohoo!) and then the new version should be good to go. High scores in my game are gonna rock! Marmalade and Scoreloop are sweet! 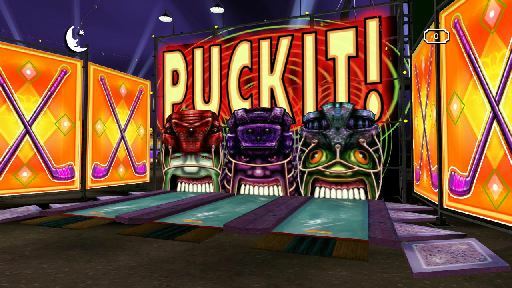 Another of the Minigames in Midway3 is called 'Puck It'. And if you are not good at playing breakout or Pong games, maybe you will such naughty verbalizations (i made that last word up i am sure!). Here is a picture of the Minigame stall. I think the artists did a great design job on this game. I am wondering if you can guess what ya supposed to do. I'll leave that up for grabs anyway, now back to regular Hockey!